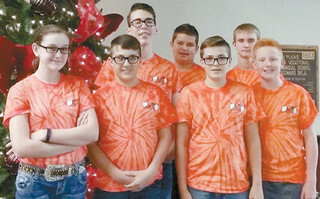 ACADEMIC… The 7th and 8th grade Academic Team won Third Place at Regional competition in Woodward last week and will be headed to the Area Tournament. Pictured, front: Ashlyn Robinson, Owen Jackson, Joshua Land, Zane Kendall. Back: Cailby Perez, Isaac Kerr and Jakob Ford.